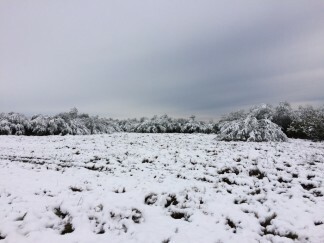 Snow in South Texas: How Did Bobwhites Fare? The recent snow in South Texas has caused several folks to ask how South Texas bobwhites fared during the unusual weather occurrence (Figure 1). Did many die? Did they freeze? Did it matter to them at all? snow ranged from a few inches to about 10 inches. 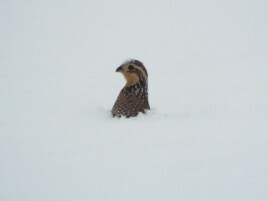 Believe it or not, this is not the first time that South Texas bobwhites have had to endure snow in the recent past. If you recall, 13 years ago, many of us woke up to a white Christmas in 2004.We received numerous calls then from people expressing concern for the well-being of bobwhites, as we did during last week’s snowfall. 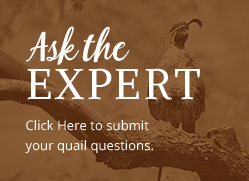 Thanks to the long-term nature of our quail program at the Caesar Kleberg Wildlife Research Institute, we have data that can provide valuable insight into how bobwhites fare during snowfall in South Texas. The short answer is that snowfall (South Texas style) does not appear to have much impact on bobwhites. During the snowfall of 2004, we were monitoring about 50 radio-marked bobwhites prior the arrival of snow as part of our South Texas Quail Research Project. Snow began falling on Christmas Eve (24 December 2004), with complete snow cover by Christmas Day. Reports of snow cover ranged from a few inches in Brownsville to 10–12 inches in Victoria. We monitored the radio-marked bobwhites a few days after the snow and documented that only 3 out of the 50 bobwhites had died during this interval. We observed similar findings during last week’s snowfall. We were monitoring 12 radio-marked bobwhites prior to snowfall (6 December 2017) as part of a quail study near Goliad, Texas. Snow began falling during the early morning of Friday (8 December 2017), with reports of accumulated snow cover ranging from a few inches near Goliad to about 8–10 inches in isolated parts south of Kingsville. We monitored the radio-marked bobwhites on Friday morning and documented that none of the 12 birds had died. The radio-marked bobwhites remained hunkered down as coveys (presumably at roosting sites) at least until noon. The remains of the dead bobwhites during the 2004 snow indicated they had succumbed to predation. However, it is possible that the birds died from exposure to the snow and subsequently were scavenged, thereby appearing depredated. In any case, only very few or no bobwhites died during either snowfall event, and it therefore appears that the snow had little impact on South Texas bobwhites. There are several reasons why bobwhites fare well through snow in South Texas. Typical body fat for bobwhites is about 10–12%, with starvation occurring at about 4%. If the snow cover had lasted several days with the ground iced over—thereby forcing bobwhites to maintain their high body temperatures in freezing conditions without being able to feed—then even healthy bobwhites would be in jeopardy of starvation. However, given the brief and relatively mild nature of snow events in South Texas, it is easy to understand why bobwhites would not be dramatically impacted by snow. Like many folks in South Texas, bobwhites probably were just curious what that strange, white fluff was on the ground…or on their heads (Figure 2). mortality during such rare events.